The Onkyo CS-445 Mini Receiver is the audio solution for space conscious individuals. Complete with an integrated iPod connection, the mini receiver has the right balance of performance, practicality, and price. With its compact size and lightweight feature, the versatile CS-445 can be set up just about anywhere in your home. Inside the mini audio system is a cutting-edge CD receiver that loads regular compact discs and recordable compact discs encoded with compressed sound files. 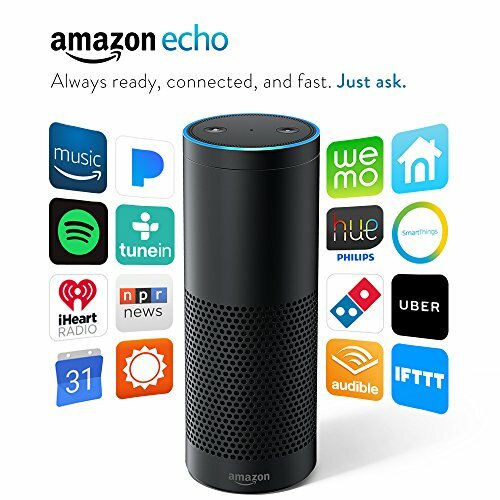 It is designed to further expand playback options, thanks to its built-in iPhone and iPod dock that allows instant hook-ups and recharging of these devices at the same time. With Onkyo’s concrete track record in home audio systems, the amplifier system and processing circuitry of the CS-445 remains unchallenged among its class. 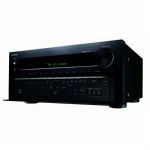 Onkyo’s CS-445 is equipped with not just one, but a dual-channel digital amplifier that easily generates 40W per channel at 4ohms and 20W per channel at 8ohms. The bass (80hz) and treble (10khz) can be adjusted from the remote and front panel by plus/minus 10decibells. When activated, the Super Bass feature will let you add an additional +7.5decibels of bass (Hz). Unlike regular receivers, the speaker outputs of the CS-445 comes with binding posts that will let you connect them through pin connectors, single banana plugs, or bare wire. The binding post has a collar around it that discourages the use of spade lugs, while its terminals have distant spaces in between them to use dual banana plugs. 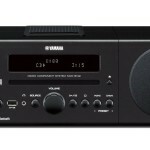 The mini receiver features a single-disc CD player that can launch audio CDs as well as CD-RWs and CD-Rs. Aside from playing 8cm CDs and standard 12cm CDs, it can also play back MP3s and WMA files at 32-320 kbps and 64-160kbps respectively. The Onkyo CS-445 has 4 playing modes (normal, folder, memory, and random), 3 repeat modes (folder, disc, and track), and up to a 25-track programming. Its disc player has a single-bit D/A converter while the remote control features a numeric keypad for accessing the audio tracks easily. The FM/AM tuner feature comes with a total of 40 presets which can be split per band as needed. These presets can be named up to 12 characters each for quick identification. 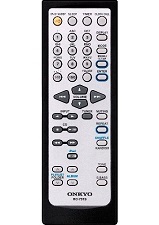 Selecting a preset directly can be done through the remote’s numeric keypad. The AM frequency tuning interval is at 10kHz while the FM’s interval is approximately 0.2mhz. The unit comes complete with an FM wire antenna and AM loop antenna upon purchase. 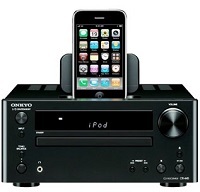 An integrated iPod dock can be found on top of the Onkyo CS-445 mini receiver, which can accommodate the Universal Dock adapters of iPhones and iPods. Besides playing music, the mini receiver will also output video via the composite video out. 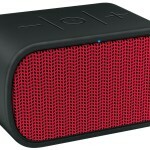 It takes a digital signal from the iPhone or iPod for superior sound quality. While the control scheme in the front panel of the unit will only let you play, pause, stop, and choose the previous/next tracks, the remote control will let you access the iPhone/iPod’s menu for searching and choosing videos or music with complete playback. It also works double time by charging your iPhone/iPod, even when in standby mode. 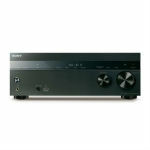 The Onkyo CS-445’s main unit measures 8.1 by 13.1 b 3.9 inches and weighs 9 pounds while its speaker system measures 5.4 by 9.1 by 9.2 inches and tips the scales at 5.1 pounds. It comes with a timer, sleep timer, digital clock as extra added features. Completing the mini receiver set are 2 precision-engineered bookshelf speakers integrated with Onkyo’s exclusive OMF diaphragms. The CS445 mini receiver is protected by the company’s 1 year limited warranty on labor and parts. 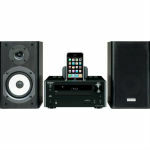 This receiver system is ideal for using in a small single room and will provide you with a good quality, clean sound. It is of a nice compact size, so it can easily fit on a bookshelf or under the TV set if you like. It is very easy to use, and the features are all very intuitive. 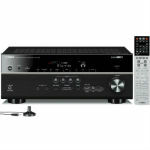 For the price of this unit, the Onkyo CS-445 provides really good value for money considering the quality it offers.